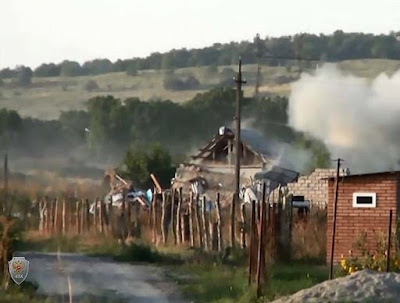 Police had tracked the four extremists to a house in the village of Psedach in south western Russia's Republic of Ingushetia, where they ordered the men to surrender. However, rather than give themselves up, the group opted to set of a bomb which destroyed their hideout, killing all four of them. The gang of extremists had been hunted by the Russian secret services in connection with the attempted murder of policemen. Federal Security Service operatives surrounded their hideout, and the group began shooting at the officers, who returned fire. 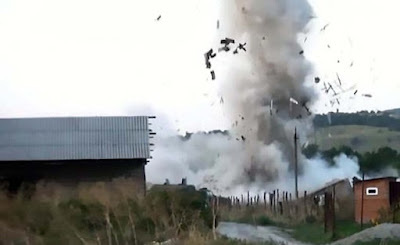 Photos show how the huge explosion from their suicide bombs ripped the roof off the little cottage.